do you have audio 'out' on the TV? I have audio in. Cant see any out. have you plugged the red and white into the adapter and the adapter into the blue socket? And is the power on!? so do i connect the adapter (with red and white attached) to the video in socket on chair (green socket)?? Where does the other part of this lead go?? Sorry for all the questions, especially since you prob can't remember the setup since your at work. has the hdmi cable got seperate audio (white and red phono's)? no its just one cable. would i have to use my xbox using the leads originally supplied. unless you have one of these? yeah i connectedit up using the original cables and sound works fine. Shame I can't use the hdmi tho. You do notice a drop in picture quality. Thanks for your help ctuk. 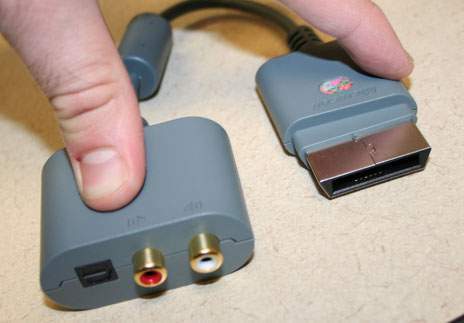 Anybody know if it is possible to connect via hdmi with no audio out on tv?? Would that allow me to connect via hdmi and still get the sound throught the chair? works on my mates elite, nvm. dont know much about the chairs but has your tv got a headphone socket? OMG man you are a legend. Didn't even think of doing that. Cheers rep added. Also thanks to all the other replies.